How IGBT Switching characteristic works ? Switching characteristics of an IGBT during turn-on and turn-off are sketched in fig. Turn on time is defined as the time between the instant of forward blocking to forward on state. Turn on time is composed of delay time tdn and rise time ton = tdn +tr. The delay time is defined as the time for the collector emitter voltage to fall from VCE to 0.9 VCE. Here VCE is the initial collector emitter voltage. Time tdn may also be defined as the time for the collector current to rise from its initial leakage current ICE to 0.1 Ic. Here Ic is the final value of collector. The rise time tr is the time during which collector-emitter voltage fall from VCE. It is also defined as the time for the collector current to rise from 0.1 IC to its final value IC. After time ton, the collector current IC is and the collector-emitter voltage fall to small value called conduction drop is said to be VCES where subscript S denotes saturated value. The turn-off time is somewhat complex. It consists of three intervals : (i) delay time , (ii) initial fall time and (iii) final fall time. 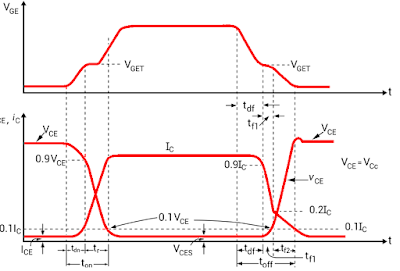 The delay time is the time during which gate voltage fall forms VGE to threshold VGET. As VGE falls to VGET during tdf, the collector current falls from Ic to 0.9 Ic . At the end of tdf, collector emitter voltage begins to rise. The first fall time tf1 is defined as the time during which collector current fall from 90 to 20 % of its initial value of current IC, or the time during which collector emitter voltage rise from VCES to 0.1 VCE. 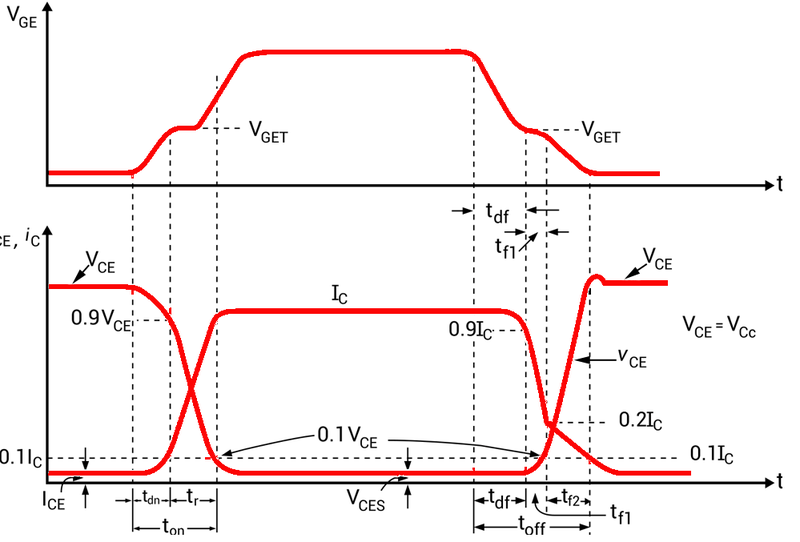 The final fall time tf2 is the time during which collector current fall from 20 to 10% of Ic or the time during which collector emitter voltage rise from 0.1 VCE to final value VCE shown in figure.